Patna skipper Pardeep Narwal collected his ninth super 10 of the season. 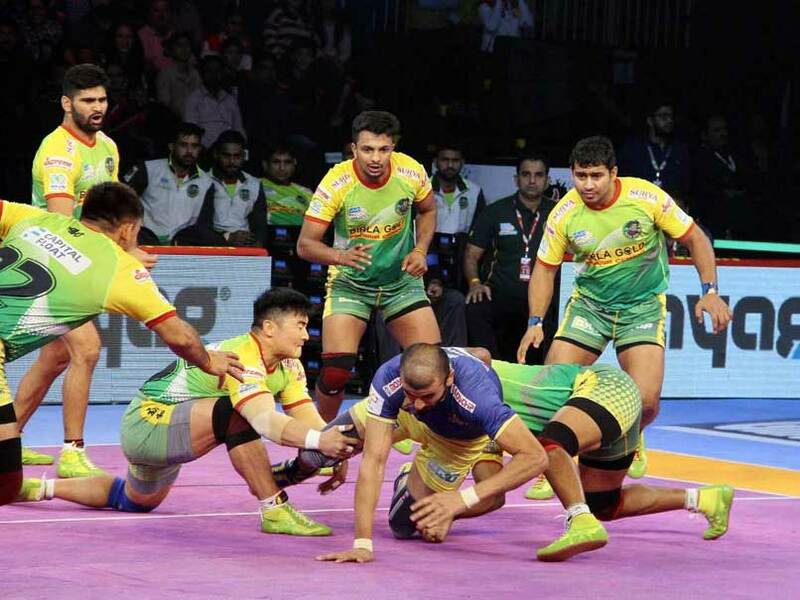 Defending champions Patna Pirates witnessed a strong performance by its raiders as they thumped Tamil Thalaivas 45-27 in a zone B clash of the ongoing sixth season of Pro Kabaddi League (PKL) in Ahmedabad on Wednesday. Patna skipper Pardeep Narwal, who collected his ninth super 10 of the season, picked 13 points, while Deepak Narwal also had a great night with 10 points. Tamil Thalaivas' defence had a night to forget as they scored just four tackle points. skipper Ajay Thakur chipped in with eight raid points for the Thalaivas. In the other match of the day, home franchise Gujarat Fortunegiants edged past U Mumba to win the contest by a narrow 39-35 margin. Gujarat Fortunegiants were trailing for most of the match but came to life in the last 10 minutes of the match to win the top of the table clash in Zone A.
Prapanjan got a super 10 for Gujarat and Parvesh Bhainswal was a rock at the back as he got yet another high five. Siddharth Desai got 13 points for U Mumba but his effort went in vain. U Mumba remain top of the table in Zone A with 57 points from 15 games but Gujarat are catching up and remain second with 53 points from 13 games. Coming to the first match, after the win, Patna are now second in Zone B with 38 points after 13 matches whereas the Thalaivas lie at the bottom of the table with 25 points from 13 matches. Pardeep got Patna up and running with two raids in the first minute. The Thalaivas were slow to get out of the blocks as they scored just one point in five minutes to trail 1-6. 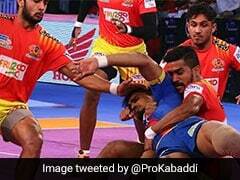 They suffered an all out as Patna asserted their dominance to lead 10- 1. Thakur put points on the board for Thaliavas as he made two successful raids. After 10 minutes of play, Patna Pirates held an eight-point advantage as they led 12-4. Thakur came up with a two-point raid in the 13th minute to cut the deficit to five points for Thalaivas before coming back strongly before the end of the half as they inflicted an all out to trail 11-14. Deepak's two-point raid in the 20th minute meant that Patna Pirates led 16-13 at the break. Tamil Thalaivas started the second half strongly with Surjeet making a two-point raid but Deepak responded for Patna Pirates with a raid of his own. Patna Pirates led 20-15 after 25 minutes of play and were looking in control of the match. Jasvir Singh got Tamil Thalaivas back in the match with a two-point raid in the 29th minute. Patna Pirates however inflicted another all out in the 30th minute to lead 27-20. Tamil Thalaivas defence let them down as apart from Manjeet Chhillar, no other defender could stop Patna's raiders. After 35 minutes, Tamil Thalaivas defence scored just four points as they trailed 22-32. Pardeep made a two-point raid with his trademark 'dubki' in the 37th minute to give Patna Pirates 37-23 lead. Manjeet averted an all out for Tamil Thalaivas with a quick raid. However, Patna Pirates inflicted another all out in the 40th minute as they won 45-27.